Though immediate investor reaction saw share prices drop following the results of Apple's September quarter, analysts on Wall Street are thinking longer term and remain bullish about AAPL stock. Apple earned $46.9 billion in revenue in its fourth fiscal quarter of 2016, coming in just slightly ahead of consensus estimates with $1.67 earnings per share. Analysts on Wall Street generally gave the results a warm reaction, and highlights of their thoughts as compiled by AppleInsider follow. Wall Street analysts remain bullish on Apple heading into the fall and throughout 2017. Analyst Gene Munster sees Apple staying in mid-to-high single-digit growth for at least the next two years, riding the strength of the current iPhone 7 lineup and the anticipated 2017 handset redesign. Accordingly, he has raised his price target on shares of the company to $155. In Munster's estimates, iPhone growth will remain steady in the 5 to 13 percent range over the next 7 quarters. Munster noted that shares of AAPL slid about 3 percent in aftermarket trading on Tuesday, after Apple reported its results. The immediate selloff came as a result of a pre-earnings increase in investor expectations regarding guidance for Apple's current December quarter. To Munster, that outlook is misguided, and Apple's September quarter results and December quarter guidance indicate that the company's "franchise appears intact." Piper Jaffray has maintained its "overweight" rating for shares of AAPL. Analyst Timothy Arcuri believes Apple is doing a great job "threading the needle" by meeting investor expectations while also maintaining tight controls on supply. He believes the company is looking to avoid inventory issues it saw with the iPhone 6s series. In his view, there is no replacement product for the iPhone other than another iPhone. He believes the anticipated 2017 iPhone refresh, reflecting the handset's 10th anniversary, could prove to be a "powder keg" for sales. "We would be buyers with a $135 target that could easily be ~$145-$150 based on a scenario with current comparable multiples and AAPL's historic discount to such peers," Arcuri wrote. In addition to a $135 target, his company has also maintained an "outperform" rating. Of particular interest to analyst Ben Schachter were Apple's services business, which saw a 24 percent increase, and its App Store revenues, which were up 43 percent year over year. He believes App Store revenues were around $7.8 billion last quarter and $28 billion for the fiscal year. That would make the App Store 22 percent larger than Mac sales for the year and 35 percent larger than iPad sales. Macquarie estimates that Apple's total services business accounted for 27 percent of gross margin in the quarter and 21 percent for Apple's fiscal year 2016. He believes investors should focus more on the new revenue opportunities tapped into by the company. The iPhone business, of course, takes center stage, and Schachter also noted that Apple's guidance implies a return to iPhone growth in the current December quarter, despite continued supply issues. Macquarie Research has reaffirmed its "outperform" rating for shares of AAPL, with a 12-month price target of $133. Any sell-off of Apple stock should be seen as a buying opportunity for investors, analyst Amit Daryanani believes. He sees Apple on a path to $10 earnings per share by fiscal year 2018. In all, Daryanani believes Apple is off to a "solid start" for the iPhone 7 product cycle. He believes the current flagship iPhone lineup will see stable sales over the next year. RBC has maintained an "outperform" rating for Apple stock, with a price target of $125. Time for a change at the top. Wall Street is filled with a bunch of self-righteous idiots who could care less about the success of any company. All they care about is making money short term. Tim Cook is doing fine for Apple. Wall Street is killing AAPL because they can and it benefits them. Trust is not a word Wall Street uses. All they care about is lining their pockets at the expense of hardworking people. We all know the Stock Market is simply legalized gambling with minimum control, which can be bought. It didn't matter how good or poor Apple's results were -- the stock would have declined. Apple could have announced $100 billion in revenue for the quarter and the stock would have gone down. "...analysts on Wall Street are thinking longer term..."
They should be positive with this great Q4 and the projections for Q1. When Jobs was CEO Apple would regularly be rewarded after earnings. Problem is Wall Street/Investors have ZERO trust in Tim Cook. Facts are Facts. The fact is Wall Street and investors don't trust Cook. Period. Its been 5 years and its the same story every quarter. Again why should the most INNOVATIVE company on the planet settle for a BORING CEO? Why? Tim Cook is pure boring. He has no moxy, no excitement, does not have IT. That is not his fault. Not many people have those qualities. But to head the most powerful, most innovative, most valuable company you can't be a data pusher. Cook needs to be out as CEO. He is the perfect COO for Apple. Time for you to learn a new freaking song. Cook is doing a fine job running Apple. If I'm going to complain, it's going to be a the length of time between Mac refreshes. Wall Street doesn't give a Sog's turd if Cook's the CEO or not. They're fine with a boring CEO that consistently cranks out good numbers. They're tuned into Apple's guidance from previous earnings and the "law of large numbers." "A large entity that is growing rapidly cannot maintain that growth pace forever." And consistent with the "law," Apple hasn't maintained a rapid growth pace. The guidance for the coming quarter is very positive. I think the new laptops are going to do better than most people expect. I've got a lot of money locked up in AAPL and I'd like the price to catch up to the earnings. Getting rid of Cook might do that, but not in the way you have in mind. Steve Job use to tell the analysis to F themselves in his own way, and Cook does a little more pandering to Wall Street Analysis, but also tell them to get lose. Because of this Wall street whips them like a pig and profits on the way up and down. This is nothing new, I made a fortune on Apple back in the day when it would swing 20% to 30% on earning and product announcements. It was so predicable and like clock work. today the small swings are not worth the effort to do the trades. However, Apple will continue to run up this year and they will kill in in December and through the first half of next year. Sell in Dec and buy back in Q2, or buy right before the dividend day and sell and buy back again. I listened to the call and was appalled at the arrogance from the analysts. They were truly brutal disparaging the Apple management team. I don't think I've ever heard anything like this targeting a profitable company, let alone the largest, and most profitable company in the world. I thought maybe I was mistaken and spent some time last night re-listening to the comments and came away shaking my head. Apple remains a key pillar in my personal investments, and I think that Tim and his team continue to do a stellar job. The iPhone 7 really is the best iPhone I have ever owned (and I have had most of them). I'm looking forward to upgrading my 2009 iMac soon (and will be watching the new products debut tomorrow morning). I use Apple products both personally and in my business and I can confirm that they synergistically provide me with great personal and economic value. The analysts today are "wacked", they denigrate Apple but praise Tesla (which I am shorting by the way). Their prognostications and market sway are, IMHO, causing mis-allocation of capital in the US markets, as their comments drive investments to companies that don't make economic sense. This robs healthy economic drivers of much needed capital, and wastes capital on high flying mythical unicorns, many of which ultimately crash back to earth. Investment is about fundamentals, and Apple has a good fundamental business model that is easy to understand (delivering state of the art products and services that are highly valued and respected by customers). The company provides a nice dividend and sits atop the worlds single largest hoard of cash - available in case of downturns and for strategic acquisitions. Simple, extremely profitable, with great products and services - that is a company model that makes sense to me and one in which I will invest. wrong. Wall Street trusts Google, Microsoft, Tesla, Amazon, ect. Pretty much every single mega Tech stock except Apple. The reason? Because they don't trust Cook. With Cook at CEO, Apple is valued about 50-100% less than when Jobs was CEO. If Jobs was still CEO Apple would be worth $150-$200 right now. This is based on Apple's PE ratio when Jobs was CEO. My hope is Buffett invests more in Apple and strong arms a seat on the Board. Then he uses that power to oust Tim Cook once and for all. Why should the most innovative company in the world have a BORING CEO? Its totally ridiculous. Steve Jobs biggest mistake was making Cook his successor. I agree with some of the prior comments, the analysts and their questions were ridiculous. If you run a company and get asked, "do you plan to buy any big companies in the future? ", what should he say? Tim said the obvious...we are always looking at things. 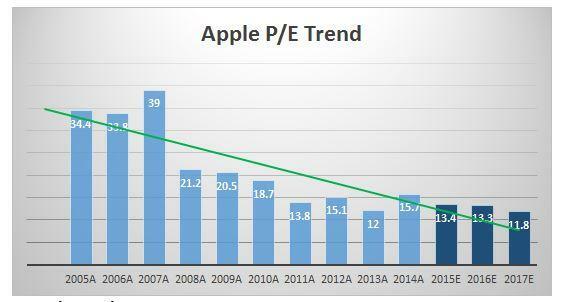 The P/E of AAPL hasn't really changed much in the post-Jobs era (see image). It's been flat since the end of 2011. You could even say that under Jobs it was crashing from 2005 to 2011. It's been undervalued for many years, and many people try to explain it (no real answer). Overall, I'm happy with the report. I'm a big investor in AAPL. Yes, it has it's ups and downs, but long term it has been amazing. Combine that with the 10% yearly increase in dividends and it is becoming a really nice stock. YTD the AAPL stock has gained 9%. In the past 5 years it's 103%, and in the past 10 it's 900%. I personally can't complain about the numbers, and am looking forward to the next dividend payment on Nov 10. Just look at the facts. Amazon, Google, Microsoft are all at near ALL TIME HIGHS. Microsoft has not grown in 9 straight quarters. Sheesh. If only you had bought MSFT, right? Microsoft investors just now got back to where they were 16 years ago. Apple was trading at a split-adjusted $1.83 16 years ago. If there so positive then why is the stock down $4 a share. If this was Google or any other stock it would be up $25 a share. If they look at the big picture Apple is still making loads of money. If it were losing money then I could see the stock drop. But Apple is still way in positive territory and with new Macs on the way soon that will only increase. The market still treats Apple unfairly to this day. Tim Cook has grown Apple 10 fold since he became CEO and has nothing to do with him. The market has always treated Apple differently in a negative way. It's like they never believe anything they do will work even after 10 plus record years. Your memory of Apple under Jobs is misguided at best. Stop acting as if things would be so different. You do not know. None of us do. But I believe things would be about the same product-wise. The stock would absolutely be less than it is today. Face it. iPhone peaked and that would've happened under anyone including Jobs. That is all they are reacting to again this quarter. So did investors trust Jobs? Apparently not according to your logic because AAPL is at an all-time high long after Jobs died. Stop making emotional arguments on behalf of investors and using words like "trust". You sound silly. That is pure bullcrap. I had a freaking margin call about 10 years ago when I made a bet on AAPL going up after earnings and it just didn't and rarely ever does work that way. The actual results are much more like a bit of a run before earnings and a fall on the news. You're a broken record. STOP QUOTING SOG35. Just block him and relish the quiet. I am long on AAPL but I understand some negativity surrounding the stock. All Apple's businesses declined except for services. But services have a ceiling for growth, imposed by hardware sales. I mean, how many Android Apple Music users are there? It's not like the good old days of iTunes, or at least, it doesn't seem to be that way so far. The car? That seems to be done. The watch? Seems like a nice little hobby more than an engine of exponential growth. So any realistic foreseeable growth is coming on the back of the next iPhone, in a world where smart phones are reaching market saturation. It's a formula for robust profits and continued profitability for Apple, sure thing -- but growth? Not so much. And without that obvious potential for exponential growth, there is no investor greed, and without that greed, there is no share price growth. So yeah... the best tech company in the world is a value play. Apple is well-run. Great work, Apple. But maybe there is a deficit of vision there... idk. Wall Street ... positive ... apple ... ? This is planet earth right? I have not slipped into a parallel universe? until you can give us minutes from that last board meeting at apple where cook was saying no to everything and frustrating all the other heads at apple, please stop pretending to do so. Perhaps getting rid of Balmer helped. New vision certainly has. But Wall Street has been a popularity game for years- statistics and prediction is not as valuable as it used to be.